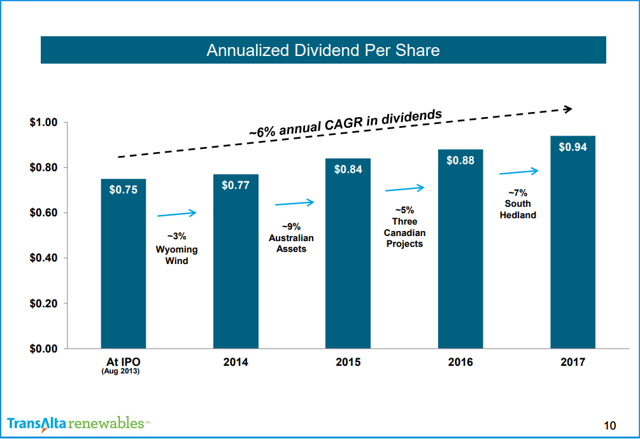 TransAlta Renewables offers investors a 6.8% dividend yield that has grown at a CAGR of 6% since 2013. Regulated utility with cash flow underpinned by long term power purchase contracts. Positive full year results for 2018 have been accompanied by a 31% rally in the share price YTD. Moderate growth in cash flow and dividendsshould continue to outpace inflation and offer investors a steadily growingsource of monthly dividend income. TransAlta Renewables Inc. (OTC:TRSWF) is a diversified regulated utility provider offering investors a steady 6.8% dividend yield. This attractive payout is a monthly dividend that has grown at a CAGR of 6% since 2013. The company has been steadily growing its asset base and generation capacity through development, acquisitions and drop downs from its parent company. TransAlta Renewables is a good option for investors seeking growing dividend income from a relatively low-risk investment. TransAlta Renewables is an electric and gas utility that owns and operates energy generation and transmission assets in Canada, the U.S. and Australia. TransAlta Renewables based in Calgary, Alberta is a sponsored vehicle of parent company TransAlta Corporation (TAC), which owns 61% of TransAlta Renewables. TransAlta Renewables was launched in 2013 by TransAlta to house the firm's long-term contracted gas and renewable assets. TransAlta Renewables trades as RNW on the Toronto Stock Exchange and has a market capitalization of $3.7B CAD exceeding that of its parent company, which has a current market capitalization of $2.7B CAD. TransAlta Renewables is one of the largest owners of wind farms in Canada, with 1,332 MW of capacity. In addition to wind farms across Canada and increasingly in the U.S., the firm owns natural gas electrical generation facilities in Canada and Australia. While the majority of TransAlta Renewables' electrical generation and revenue are attributable to a fairly equal mix of wind and natural gas, the firm also owns small solar and hydro projects. 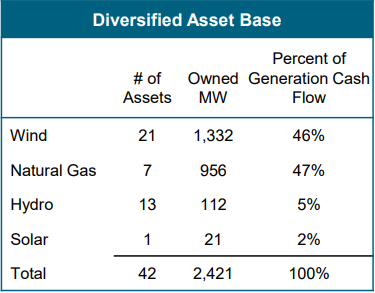 While hydroelectric facilities only account for ~5% of cash flow, these assets are characterized by low cost operations and are in locations where new greenfield development would be unlikely. With a significant portion of revenue derived from natural gas, TransAlta Renewables is not really a pure play renewables company. Investors seeking to invest in non-carbon assets should look elsewhere. For the full year 2018, TransAlta Renewables reported promising results. The firm posted AFFO above the company's guidance, an increase of CAD $15M over 2017. At the same time, cash available for distribution increased by 4% year over year and also came in above the company's original guidance. While energy generation increased slightly from 2017, year over year revenue growth was essentially flat. 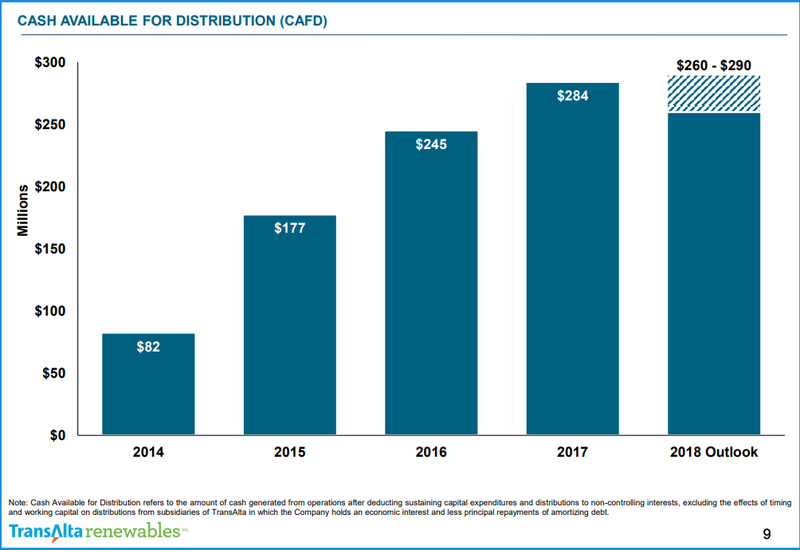 In 2018, TransAlta Renewables increased net earnings attributable to shareholders to CAD $262M from $9M the year previous. This represents growth in per-share net earnings from CAD $0.04 to $0.92. These positive results were a strong catalyst for the recent stock price rally. Clear visibility on sources of future revenue growth is important for understanding how a firm will be able to fund dividend increases or share buybacks over the long term. Since 2014, TransAlta Renewables has invested CAD $3.1B in project development and has grown its portfolio of energy generation to 41 facilities. 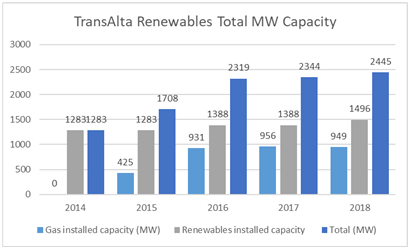 Through strong sponsorship from TransAlta, its parent firm, the renewables vehicle completed several large undertakings from 2014-2015 in excess of 500MW in Canada and Australia. Since then projects have been smaller in scale and have mainly been wind projects adding approximately 380MW of capacity since 2016. In 2018, the firm competed the acquisition of two wind projects in the Northeast U.S. These two projects will add ~119 MW of new generation capacity and come with 15 & 20-year power purchase agreements in Pennsylvania and New Hampshire. 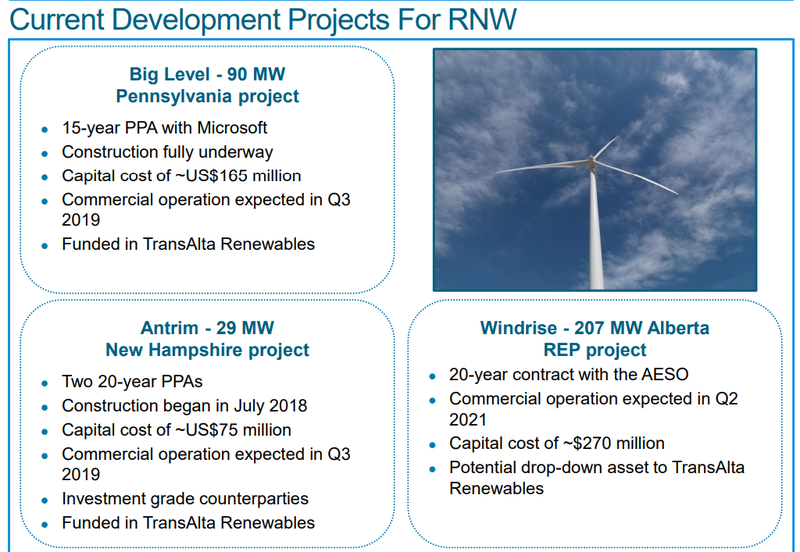 Last year, TransAlta Renewables invested CAD $166 M, in the 50 MW Lakeswind Wind Farm in Minnesota, a 21 MW solar project in Massachusetts, and the 20 MW Kent Breeze Wind Farm located in Ontario for another ~91MW of additional power. While these projects have been positive for TransAlta Renewables, the current development pipeline is a little lean with only 326 MW of new power generations secured out to 2021. The firm reports that they have identified significant growth opportunities in Western Canada and the U.S. Pacific Northwest and are currently evaluating up to CAD $5B in projects. Over the next two years, TransAlta Renewables should generate significant cash flow which can be allocated to fund growth. Future growth is also likely to come from drop downs or assets sales from the parent company. TransAlta views their renewables holdings as an important source of funding for future growth. Drop downs and asset sales from the parent firm will be independently evaluated and approved by TransAlta Renewables independent board of directors. Another likely source of growth will be through acquisitions of third party assets in North America, especially construction-ready wind assets as were executed in 2018. TransAlta Renewables stock has surged 32% year to date pushing it to its highest levels since October 2017. This run up has likely pushed TransAlta Renewables closer to its full valuation from deeply discounted levels. Despite this surge in price, TransAlta Renewables still looks reasonably priced. On a price to cash flow, TransAlta Renewables is currently trading at 9.31X, slightly below its 5-year average of 9.47X. From both a P/E and B/B perspective, TransAlta Renewables trades at a reasonable level when considered against it comparators. The firm compares against itself against a number of peers including Northland Power Inc. (OTCPK:NPIFF), Algonquin Power & Utilities Corp. (AQN) and Brookfield Renewables Partners L.P. (BEP). With a P/E ratio of 15.0X TransAlta Renewables trades a discount to its peers and the sector average of 39.9X. On a P/B basis TransAlta Renewables is trading up from its 5-year average of 1.31X, but it is still below the sector average of 1.8X. While these valuation metrics do not suggest that the stock is overly expensive even with its recent run up, there is also little growth priced into the stock. Other utility providers trading at higher P/E ratios likely have better long term growth prospects and more upside potential on their stock prices. TransAlta Renewables is an attractive dividend stock for a number of reasons. Firstly, its current yield of 6.78% is high even for a utility. TransAlta Renewables pays a monthly dividend of CAD $0.07833 for an annual pay out of CAD $0.94. Monthly dividends are preferable to quarterly dividends for investors who rely on dividends for retirement income. In 2017, dividends per share were CAD $0.90 or 74% of the CAD $1.21 per share available for distribution. For the year ended in 2018, this payout ratio had increased to 82%, or CAD $0.94 per share in dividends out of the CAD $1.15 cash per share available for distribution. These ratios imply that the dividend is well covered and there is little risk of a cut. Unlike the parent company TransAlta, TransAlta Renewables has not cut its dividend. In fact, it has continued to grow at a compound annual rate of 6%. Given the reasonable growth prospects for the firm's cash available for distribution derived from future growth projects, parent company drop downs and acquisitions, I expect that the dividend should continue to grow in line with CAFD in the low to mid single digits over the long term. Notably, however, the firm has not announced a dividend increase since September 2017, marking the longest period without an increase since the firm's IPO in 2013. Likely this is a result of the high current yield and the lukewarm 2019 guidance for CAFD. Cash available for distribution is forecast to be in the range of CAD $270M - $300M. This puts the high end of the estimate roughly inline with the 2018 actual results of CAD $295M. While growth appears to be slowing, moderate growth in CAFD and dividends should continue to outpace inflation and offer investors a steadily growing source of dividend income. As a regulated utility, TransAlta Renewables is a lower-risk investment. The regulated nature of the business means that there is low risk for major cash flow fluctuations. 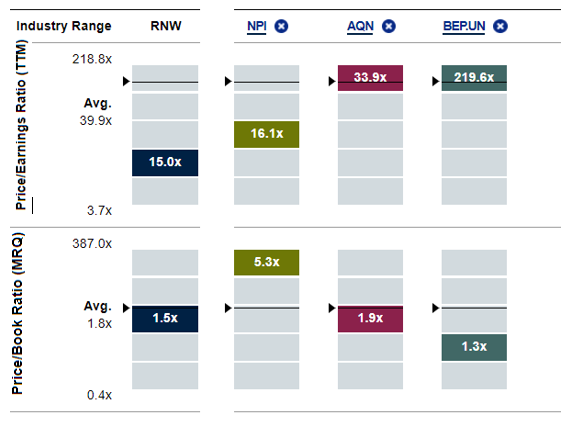 However, despite utilities being seen as "widow and orphan" quality holdings, high-yielding utilities have the potential to be impacted by rising rates. As a Canadian company, U.S. based investors receiving this dividend would be subject to a withholding tax in unsheltered accounts. TransAlta Renewables has high quality assets in markets where demand has a decent growth profile. The only red flag I observe in their asset base is the concentration of Australian gas assets in the western portion of the country. Australian natural gas assets are situated to produce energy for industrial metal production. The power purchase agreement on these assets have an average duration of 11 years remaining. The future demand for Australian metals could be hampered by an economic slowdown in China, which in turn could cap future demand for TransAlta's energy producing facilities in this region. The parent company TransAlta has been left holding the bag after legislative changes in the Canadian province of Alberta forced the early conversion of TransAlta's coal fired electrical plants to natural gas. TransAlta Renewables owns gas assets in the Canadian province of Ontario and in the State of Western Australia. Not owning these Alberta properties shelters TransAlta Renewables from the risks of having to prematurely convert coal plants to natural gas. According to Charles Fishman, Equity Analyst at Morningstar, the strategy of converting coal to gas has not proven to be successful in the unregulated U.S. power markets. While TransAlta Renewables has avoided some of the tribulations of its parent company, investors should note that this sponsored vehicle is still a majority owned entity by TransAlta. While this relationship with the parent company can offer some advantages such as asset drop downs and the financial backing of another corporate entity, it can also add risks. Decisions made at the parent level to sell or drop down assets to the Renewable's entity may require incurring debt or issuing equity to finance a transaction that may be to the parent company's benefit. For investors eyeing the turnaround of TransAlta and seeking dividend income, TransAlta Renewables is a good way to gain exposure to this segment while avoiding some of the headwinds impacting the parent company. 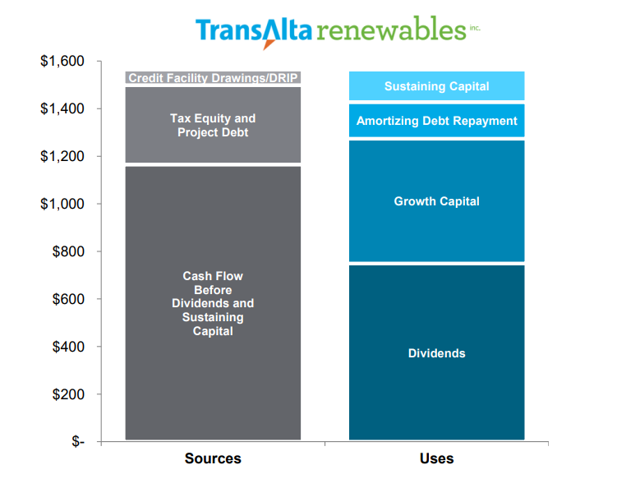 TransAlta Renewables has a 6.8% yield distributed as a safe monthly payout, making this an attractive holding for retirees. While current cash flow levels are underpinned through long term power purchase agreements, there is limited visibility on significant catalysts that would drive further share price appreciation. Moderate growth in cash flow and dividends should continue to outpace inflation and offer investors a steadily growing source of dividend income.